Let me explain my experience on installing IIS 7.0 on windows server 2008. I had a tough time to find a way to install IIS 7.0 on windows server 2008. I thought that it would be same as installing IIS 6.0 on windows server 2003 by going to "control panel" -> "Add or Remove Programs" -> "Add/Remove Windows Components" and install IIS. But I couldn't find this in windows server 2008. After doing a long research I found a link which helped me. I followed the below steps to install IIS 7.0 on windows server 2008. Go to "Start" -> "Administrative tools" -> "Service Manager". 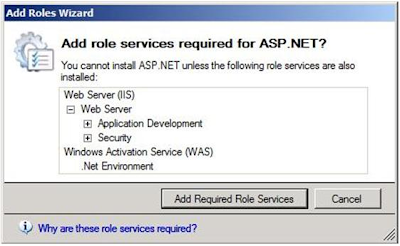 Right click the node "Roles" in the "Service Manager" window and click on "Add Roles". 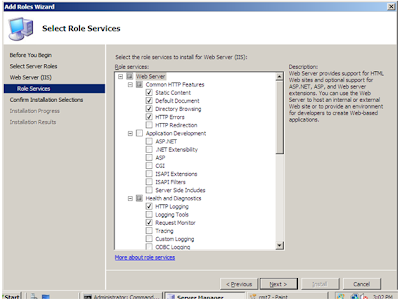 Select web server(IIS) in 2nd step of the wizard. You might get the following popup immediately. If you get this please click "Add Required Role Services". You follow the wizard until you get the below step. Follow the wizard until the final step. That's it. You are done with installing IIS 7.0 on windows server 2008. Check out the Microsoft Web Platform Installer 2.0 at www.microsoft.com/web - the easiest way to install the entire Microsoft Web Platform, including IIS, as well as other non-Microsoft Web Apps such as WordPress and Drupal. One-stop shop. Thanks Sir. You give a nice post.